This page allows a Citizen of the United Kingdom to purchase a Single Entry Business Visa for Angola. A Single Entry Visa to Angola will allow entry to the country on one occasion for up to the maximum stay within the validity period. Re-entry is not allowed. If you need the ability to return to the country within the same validity period you should choose a different visa type. Valid For: 30 days The visa validity period refers to how long the visa remains active from the time that it was issued. Please ensure that you leave the country before the visa expires. Liaison with the Angola Embassy in London for any queries and attendance where required. No more wasted time for you on the phone or in line at the Embassy. Collection, Check, Scan & Dispatch of your completed Angola Visa. Let us make sure everything is as expected for worry-free travel. Whilst Vital Consular is not affiliated with the Angolan government, we have been working with the London Embassy network since 2008. You don't have to put up with unanswered calls and long queues - we do that for you. For this, our prices include a service fee to handle your Angola visa. 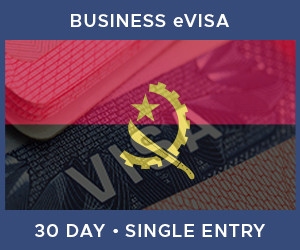 In order to apply for an Angola Business Visa you will need to supply a number of items. Click on any of the icons below to learn more about each one. Passport valid for 3 months in addition to the length of the visa and 2 blank pages. You are required to provide UK standard passport photos to acquire this visa. Proof of Means of Subsistence, equivalent to USD 200.00 for each day of stay in Angolan territory. This sum of money must be supported by a Bank Statement & Documents from online banking will not be accepted. The same proof of means of subsistence should also be shown at the border post. Hotel booking confirmation. If you are not staying at a hotel, you must provide proof of your accommodation during your stay.